In the picture above the address bar has http://arindamcctvaccesscontrol.blogspot.com OR http://www.google.com in it. Just replace all of that with the internal IP address of your router. By default the IP address should be set to 192.168.62.1. You should see a box prompting you for your username and password. Enter your username and password now. 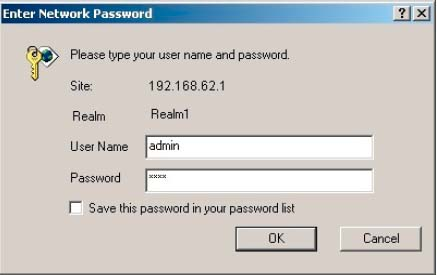 Click the Ok button to log in to your router. Click the Wireless link near the left side of the page. You should now see a new menu. In this new menu, click Wireless Settings. In the box called SSID put a name that you make up. 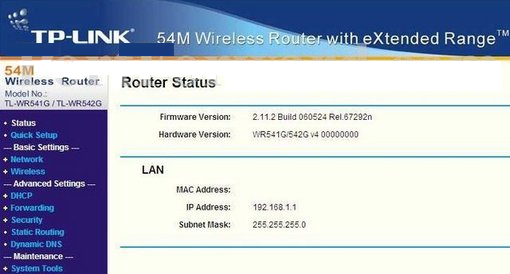 You will need to remember this name because it will be used to connect to your wireless network. Do not make it obvious to guess, the network name should be difficult for your neighbors to guess. If you can not think of anything, simply use your first name. In the box called Channel, pick a random channel number. 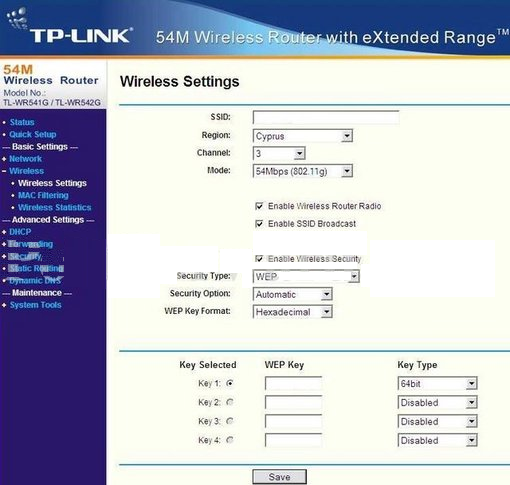 Channels make it so that you and your neighbors can use your own wireless networks without interfering with each other. By picking a random channel you reduce the chance of your neighbor using the same channel as you. Turn on the option called Wireless Router Radio. Turn off the option called SSID Broadcast. This turns off the broadcast of your networks name making it more difficult for other people to find your network. You do not want to broadcast your networks name. Turn on the option called Wireless Security. Choosing your network security type can be challenging. 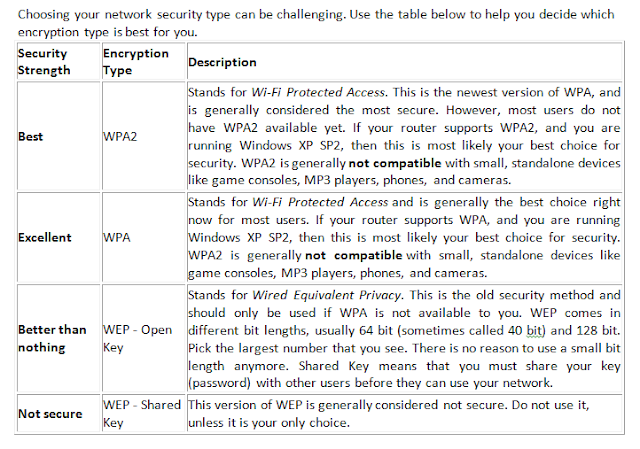 Use the table below to help you decide which encryption type is best for you. Select WEP from the Security Type drop down box. Select Open System from the Security Option drop down box. Select Hexadecimal from the WEP Key Format drop down box. Put a dot into the Key 1 radio button. Now you need to make up a passphrase. Your WPA key can be a plain text, human readable sentence. Make sure it is long, however, because recent hack attempts have exploited short WPA passphrases. Your WPA passphrase should be at least 30 letters long. Onnce you have made up your passphrase, write it down somewhere. You will need it at each computer that you are going to connect to your network. Now you need to make up your network key. Onnce you have made up your key, write it down somewhere. You will need it at each computer that you are going to connect to your network. Now put the key you made up in the box called Key 1. Select 128bit from the Key Type drop down box. When you're finished, click save near the bottom of the screen to save your changes. And that's it! You're done! Movies on film are almost exclusively projected at 24 FPS. Television, however, does not have an internationally accepted frame rate. In Europe and many other countries, PAL and SECAM use 25 FPS, whereas NTSC video in North America and Japan uses 29.97 FPS. Other common frame rates are usually multiples of these. Note: Converting video formats from one frame rate to another is technically challenging, and there are often unwanted visual side effects. This is especially true when the frame rates do not evenly divide. For example, converting 30 FPS to 60 FPS is fairly easy to do, but converting 29.97 FPS to 25 FPS is much more difficult. Making sure audio stays in sync throughout the conversion is yet another challenge. Some digital video formats support several frame rates within a single format, allowing variable frame rate video recording and film (24 FPS) compatibility. This is the universally accepted film frame rate. Movie theaters worldwide almost always use this frame rate. Many high definition formats can record and play back video at this rate, though 23.98 is usually chosen instead (see below). This is 24 fps slowed down by 99.9% (1000/1001) to easily transfer film to NTSC video. Many high definition video formats (and some SD formats) can record at this speed, and it is usually preferred over true 24 fps because of NTSC compatibility. The European video standard. Film is sometimes shot at 25 FPS when destined for editing or distribution on PAL video. This has been the color NTSC video standard since 1953. This number is sometimes inaccurately referred to as 30 fps. Some high definition cameras can record at 30 fps, as opposed to 29.97 fps. Before color was added to NTSC video signals, the frame rate was truly 30 fps. However, this format is almost never used today. This refers to the interlaced field rate (double the frame rate) of PAL. Some 1080i high definition cameras can record at this frame rate. High definition cameras can record at this frame rate, which is compatible with NTSC video. It is also the interlaced field rate of NTSC video. This number is sometimes referred to as 60 fps, but it is best to use 59.94 FPS unless you really mean 60 FPS. High definition equipment can often play and record at this frame rate, but 59.94 FPS is much more common because of NTSC compatibility. Important: Many people round 29.97 FPS to 30 FPS, but this can lead to confusion during post-production. Today, it is still very rare to use a frame rate of 30 FPS, but very common to use 29.97 FPS. When in doubt, ask people to clarify whether they really mean 30 FPS, or if they are simply rounding 29.97 FPS for convenience. What the Difference between IP Cameras and CCTV Cameras ? Many have speculated that the area of CCTV (closed-circuit television) cameras is coming to an end. These multi-purpose video cassette recorders and all their T-160 tapes are quickly being replaced by capture cards, embedded processors, codec, and more advanced devices. IP cameras have played a major role in phasing out CCTV cameras, as they offer many of the same benefits, yet provide much more. What’s the difference? Plenty! Let’s delve into some of the details and find out how IP cameras tower over their analog CCTV counterparts. The major benefit of IP cameras is the luxury to view live video via the internet from any location in the world. While CCTV cameras can enable viewing over the internet, they require additional software and hardware components to function properly. An IP camera is integrated with all the necessary tools and doesn’t require any additional installations. Some of the newer models are even able to view live video on a cell phone or other mobile device over a 3G network. The primary function of a surveillance camera is to monitor a certain area when security and staff are unable to do so. While it serves its purpose for the most part, CCTV cameras are susceptible to security breaches, and the tapes they contain can be stolen. IP cameras enable recording to remote locations, which virtually eliminates such a scenario. Even if security is breached, the intruder will not be able to steal the tape or recording device because it is physically stationed at a remote location. Because IP cameras leverage standard IP (Internet Protocol) networks, many of them are available in wireless variations to provide the ultimate in portability. All the device requires is a single cable for a power supply, which results in less work when installing the camera in the recording location. More IP cameras are being implemented with video analytics to provide advanced tracking and motion detection capability. This technology is so sophisticated that it has the ability to distinguish between the movement of a person, a car driving down the road, or a tree merely swaying in the wind. CCTV cameras aren’t completely obsolete, but are light-years behind in comparison to IP cameras. IP technology allows individuals and businesses to effectively monitor their home or office premises with little to no security risks. Evolving rapidly, it’s almost certain that you will be able to do much more with an IP camera in the very near future. What is IP camera ? Network IP Cameras have been around for at over a decade now. Only recently have cabling installers began to pay attention to the technology because surveillance cameras have traditionally run on separate coaxial cable. Around 10 years ago, the first digital IP camera connected directly to a data network which changed the future of the surveillance camera industry. During the early stages, the technology was not as professional as analog cameras. Most cameras were seen as ‘web cameras’, which were used to view objects or events over the internet or a LAN. Today IP network cameras meet the same requirements and specifications as analog counterparts and in many areas surpass analog camera performance and features . Forecasts show that the network IP camera market share is growing at a much faster rate than its analog competitor and has surpassed the analog camera in market share. An IP Camera is a networked digital video camera that transmits data over a Fast Ethernet link. IP Cameras (also called “network cameras”) are most often used for IP surveillance, a digitized and networked version of closed-circuit television (CCTV). Remote administration from any location. The ability to easily send images and video anywhere with an Internet connection. Progressive scanning, which enables better quality images extracted from the video, especially for moving targets. Adjustable frame rates and resolution to meet specific needs. The ability to send alerts if suspicious activity is detected. Disadvantages of IP surveillance include greater complexity and bandwidth demands. One alternative for organizations with substantial investment in analog technology is to use a video server to, in effect, turn analog CCTV cameras to IP cameras. A video server is a small standalone server that converts analog signals to a digital format and provides the analog cameras with IP addresses. Nevertheless, because it offers much more sophisticated capabilities, IP surveillance is increasingly replacing analog CCTV. An industry report from International Data Corporation (IDC) predicts that shipments of IP cameras and related products will increase 75% between 2012 and 2015. Mr. Arindam Bhadra is a freelance writer, professional blogger of Best leading Tech Blog in India. His blog arindamcctvaccesscontrol.blogspot.com & bhadrafiresafety.blogspot.com focuses on security & Safety bloggers. Apart from his job, he loved to spends all his time with eSecurity & Safety technology and loves to help people. He is a Tech enthusiast and has written articles over the period on this blog. You can follow him on Facebook, Twitter, VK, Vox, Pinterest, LinkedIn & Google+ etc.